Apple says that the iPhone XS Max lasts around one hour and 30 minutes longer than last year’s iPhone X in between charges. The company hasn’t officially confirmed just how big its battery is, but one regulatory filing revealed it to be 3,174mAh. 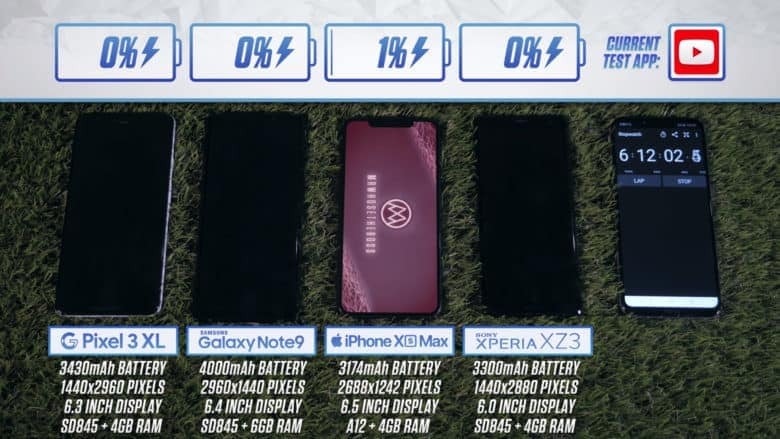 That’s smaller than the batteries installed in the Xperia XZ3 (3,300mAh), the Pixel 3 XL (3,430mAh), and the Galaxy Note 9 (4,000mAh). And yet, the iPhone XS Max still lasts longer, one speed test proves. YouTuber Mrwhosetheboss put all four phones through their paces by running a series of different apps and games to simulate every day use until they all gave up. The Xperia XZ3 was the first to die after a dismal three hours, at which point the iPhone XS Max still had 36 percent battery remaining. The Pixel 3 XL was the second to turn itself off after almost five hours and 20 minutes, at which point the iPhone sat at 11 percent. The Note 9 dropped out of the marathon at six hours and three minutes, and the iPhone finally dropped out at six hours and 16 minutes. There is a caveat to this test, however. In previous tests, the Note 9 has been able to outperform the iPhone XS Max and just about every other smartphone it goes up against. That’s hardly surprising given its beefy battery. But that’s partly because Samsung limits its display to 1080p by default. The iPhone XS Max runs at resolution of 2688×1242 — way above 1080p — so, to make this test a little fairer, Mrwhosetheboss increased the resolution of the Note 9’s display to the maximum 2960×1440. This brings the Note 9 and the XS Max much closer together. If you leave the Note 9’s display settings as they are, then, it will keep going for longer than the XS Max in between charges. But if you max out its display like Apple does with its flagships, then you’ll need to reach for a charger much sooner.